individual wires. Though not all vehicles of today necessarily require sophisticated networking technologies, the addition of features like ADAS, sensors, cameras and infotainment capabilities mean the vehicle of the future will require advanced capabilities to streamline the connectivity process. With the help of in-vehicle networking technologies like HDBaseT Automotive, the connectivity and communication that once took dozens of wires to accomplish will require very few. HDBaseT Automotive makes effective in-vehicle networking possible. It provides the answer to the main challenges existing technologies face today, such as bandwidth, EMC and latency. The technology improves safety features, making it possible to experience faster, more reliable in-vehicle connectivity. Connecting devices and displays isn’t easy, and it gets even more complicated when several devices (such as sensors or cameras) need to be connected to numerous endpoints. The solution is a central network. It allows any module to be plugged into the network, providing a means for it to communicate with all other modules. With HDBaseT Automotive, it is easier to install and deploy the wiring harness. Multistreaming, convergence and daisy-chaining allow for more simplified connectivity. Multistreaming allows different streams of data to flow simultaneously to one device; convergence bring together different features and interfaces, such as video & audio, Ethernet, controls, USB and power, over one single cable; and daisy-chaining connects multiple displays with a single cable, to eliminate extra cabling and simplify connectivity. HDBaseT Automotive enables long-distance tunneling of video and data, over a lightweight infrastructure (such as an unshielded twisted pair -UTP cable), and supports a variety of native interfaces. Overall, advancements in networking provide easier ways to maintain and produce reliable communication among different systems within the vehicle, providing for a safer, and more enjoyable driver experience. 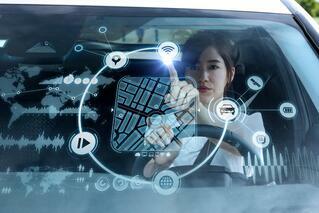 How do you see in-vehicle networking transforming the future of mobility?